WE NEED YOU, next week, to come to Concord and tell the House Education Committee NO to Common Core in NH. Room 207 Legislative Office Building behind the State House. Please come and tell the legislators the problems you’ve seen in your schools with Common Core. Tell them to vote Ought to Pass on HB 207!! Here is a link to the proposed legislation: http://www.gencourt.state.nh.us/bill_status/billText.aspx?sy=2017&id=81&txtFormat=html. This bill prohibits the department of education and the state board of education from requiring any school or school district to implement the common core standards. When you arrive, fill out a PINK CARD and hand it to one of the committee members. They will then call you up to speak. It’s important to COME to the hearing. We need as many parents there as possible. This entry was posted in NH Legislature, Political and tagged HB207 on January 12, 2017 by SCC. CALL TO ACTION: Stop the Obama Ed Reforms in the NH Senate! TWO Bills passed the NH HOUSE are on their way to the NH Senate that need your urgent attention. The following is the Senate Education Committee‘s contact information. —–>10:15 a.m. HB 1604-FN-A-LOCAL (Second New Title) relative to instructional methods to enable students to acquire and apply requisite knowledge and skills. http://nhfamiliesforeducation.org/node/769 10:45 a.m. HB 471 (New Title) relative to the duties of school boards. HB1604 Amendment language to facilitate Outcome Based Education in New Hampshire. WARNING! This entry was posted in NH Legislature, Political and tagged HB1604, HB301, HB471 on February 19, 2016 by SCC. 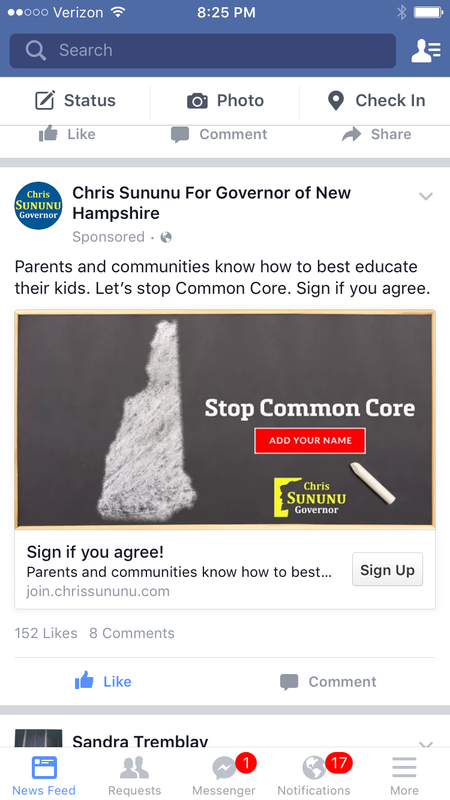 It’s great to see Governor candidates running in New Hampshire making sure voters know they oppose Common Core. Governor Hassan has disappointed too many NH parents. She’s ignored teachers and hasn’t sit down to listen to her constituents. It’s important that you let Executive Councilor Chris Sununu know you are grateful that he’s hearing the parents and teachers in New Hampshire. This entry was posted in Candidates, NH Legislature, Political and tagged chrissununu on December 18, 2015 by SCC. WARNING: Is there an effort to eliminate local control and local school boards in New Hampshire? We need you to mark your calendar for TUESDAY Nov.10th at 9am. We need you to attend a meeting at the Legislative Office Building rooms: 210-211. There is an important meeting with Marc Tucker and New Hampshire Legislators. Marc Tucker has been a vocal supporter of eliminating local control and local school boards. He is also famous for writing the “Letter to Hillary Clinton” on November 1, 1992. In this letter he lays out a plan to overtake individual state sovereignty of education. He writes, “We think the great opportunity you have is to remold the entire American system for human resources development…” This has essentially become the blueprint for the redesigning of public education under the Obama Administration. This new system will be the “cradle to grave” we heard about years ago. This is a seamless web government system, designed to manage human resources. This new system for everyone would be coordinated by labor market boards at the local, state and federal levels where curriculum and job matching will be handled by counselors. The mission is to change public schools from teaching children knowledge through rich academic content to training them for jobs selected by workforce boards in a planned economy. Nothing in his plan focuses on teaching children to read. Tucker’s plan calls for completely redesigning education into a “national public school system.” Following his plan involves bypassing elected officials who sit on local school boards or who serve in state legislatures. It involves building a database that was set up when New Hampshire received “stimulus funding.” This new date based was set up in order to collect data on students and their families. Marc Tucker has been invited to speak with legislators on Nov. 10th. It is important for you to first research Marc Tucker and to contact your legislators to let them know that we still value local control in education that is focused on academic excellence for all children. Students can then select the path in life they want to take rather than have the Government lay out the plan for them in an education system that would still be plagued with illiteracy. This entry was posted in NH Legislature and tagged MarcTucker on November 7, 2015 by SCC. We are wondering why two Republicans on the House Education Committee, Rep. Rick Ladd and Terry Wolf, are joining Democrat Rep. Mary Gile, to bring one of the chief architects of Common Core to New Hampshire WITHOUT any critics to counter his propaganda? If the two Republican Representatives have joined forces with Hillary Clinton and Bernie Sanders on this important issue, maybe it’s time for them to share that information with the rest of us! We HIGHLY ENCOURAGE ALL PARENTS, TEACHERS, and ANYONE else concerned about the erosion of local control and the problems with “Common Core,” to ATTEND THIS MEETING. The House Education Committee invites colleagues in the House and Senate to a day of continuing education entitled “Education Through an International Lens,” to be held Tuesday, November 10th at 9:00 a.m. in LOB rooms 210-211. Speakers will include Dr. Julie Bell, Education Program Director for the National Conference of State Legislators (NCSL), and Mr. Marc Tucker, President and CEO of the National Center for Education and the Economy. Dr. Bell will offer a brief introduction to NCSL and their rationale for a major study on international education. Mr. Tucker will provide an overview of how other industrialized countries compare to the U.S. on various indicators of student achievement, including educational standards, assessments and accountability, time and learning, funding and equity and teaching policy. A panel representing N.H. educators and businesses will follow. PARENTS need to write the three legislators and ask them WHY they would not invite Dr. Stotsky to this presentation given her close proximity to New Hampshire. Dr. Stotsky who is a resident of Massachusetts has visited New Hampshire many times to offer an expert analysis on the problems with the Common Core standards. Or Dr. Duke Pesta who has also traveled to New Hampshire on many occasions to bring parents critical information on Common Core. Why would they not want to offer the audience critical information on this education reform? What are they hiding and why are they attempting to keep our elected representatives IN THE DARK on this issue? This entry was posted in Candidates, NH Legislature, Political and tagged MarcTucker, MaryGile, Meeting, RIckLadd, SandraStotsky, TerryWolf on October 21, 2015 by SCC. Rep. Spang (D-Durham) continues to deny that standardized test scores will be used to evaluate teachers. As you can see from this article, there is plenty of information from the NH Dept. of Ed to suggest, that’s exactly how they will be used. LOOK OUT NH TEACHERS: you have a target on your back! This entry was posted in Evaluations, NH Legislature, Political, Smarter Balance, Teachers and tagged Durham, Evaluations, JudithSpang, Teachers on September 24, 2015 by SCC. 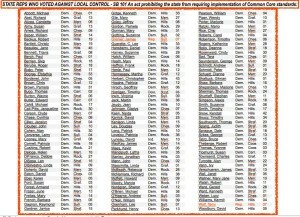 Did your State Representative vote against LOCAL CONTROL for your School District? SB 101 would have Prohibited the State from Requiring School Districts to Adopt Common Core. This entry was posted in NH Legislature, Parents, Political and tagged parents, SB101, StateReps on May 24, 2015 by SCC. HB323 PASSED the NH Senate: What Lies Ahead? Yesterday after battling to kill HB323, an amendment (1863s) was introduced by Senator Jeb Bradley​. The Senate then voted to support the amended HB323. The amended version is a huge improvement over what the NH House passed a short time ago. Remember the original version included language to implement the PACE assessment program. The problems with the PACE program were detailed on the Girard at Large Blog. We have concerns over what the NH DoE will do if this Bill (as it is amended now) is passed in to law. Will the NH DoE support a local district’s right to choose their own “test”? Will they ONLY fund the assessments they want schools to use? Will Superintendents only use assessments that are paid for by the State/Feds? IF so, that could mean MORE Common Core/Competency Based testing for your schools? Even with those concerns, it’s important to know that Sen. Bradley’s amendment does provide for the freedom and choice for schools to use the assessment of their choice. REMEMBER, the voters selected a PRO-Common Core Governor (Hassan) and her DoE is pushing Common Core & Competency Based ed (the Obama education agenda) on all schools in NH. 1) A possible fight to fund all assessments, even the ones that may not be Common Core aligned. 2) A battle to include funding in your school budget to use achievement tests if the state/feds provide no funding. 3) And finally, it’s important to elect a Governor, Senator and Representatives who are fully committed to fighting Common Core & allowing schools true local control. There are genuine concerns that Sen. Boutin (33:00) and Sen. John Reagan​ (27:00) brought to the Senate floor and we share their concerns too. It’s unfortunate that we now have to be concerned about what the NH DoE will do with a statute that supports local control in testing. Will they undermine and work against parents and schools ?? That’s the state of affairs in New Hampshire under Governor Hassan. There’s no real leadership towards literacy or academic excellence. Her vision is dumbed down workforce training. Her DoE facilitates the Obama agenda and we know that doesn’t elevate the level of excellence in our schools. This is her legacy in education. Mistrust, dumbed down Common Core standards, flawed Common Core (Smarter Balanced) assessments, parents fighting for their rights, and parents fighting the state for something better. We’d like to thank all of the good Senators who listened to the many parents who spoke out against HB323 and realized the House version could not move forward as written. The amended Senate version is a compromise that we are cautiously optimistic about. However this battle does not end here. IT will not end until we make sure our local schools have the ability to test students in a way that parents believe is best for their children. This Bradley Amendment allows for local control in assessments and we appreciate that. But we also acknowledge the sentiments voiced by Senator Reagan that has led us to lose trust in the bureaucrats at the New Hampshire Dept. of Education. We support the new amended HB323 and if it is signed in to law, we will remain actively engaged in bringing you information that highlights whether the NH DoE will be supportive or work to undermine true local control. 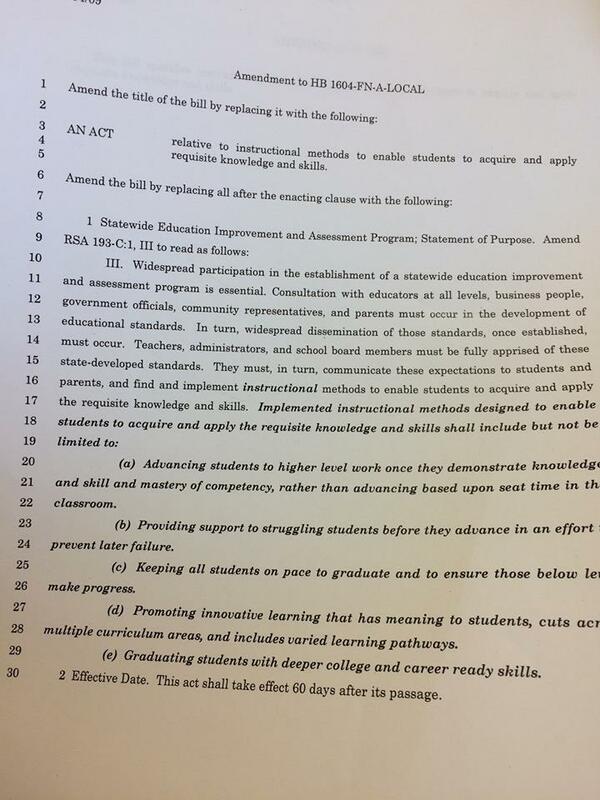 This entry was posted in NH Legislature, Political, Smarter Balance, Testing and tagged Amendment, HB323, SenatorBoutin, SenatorBradley, SenatorReagan on May 22, 2015 by SCC. NH Senator Stiles (R) and the other Democrat Senators in NH vote “YES” to KILL HB 603. 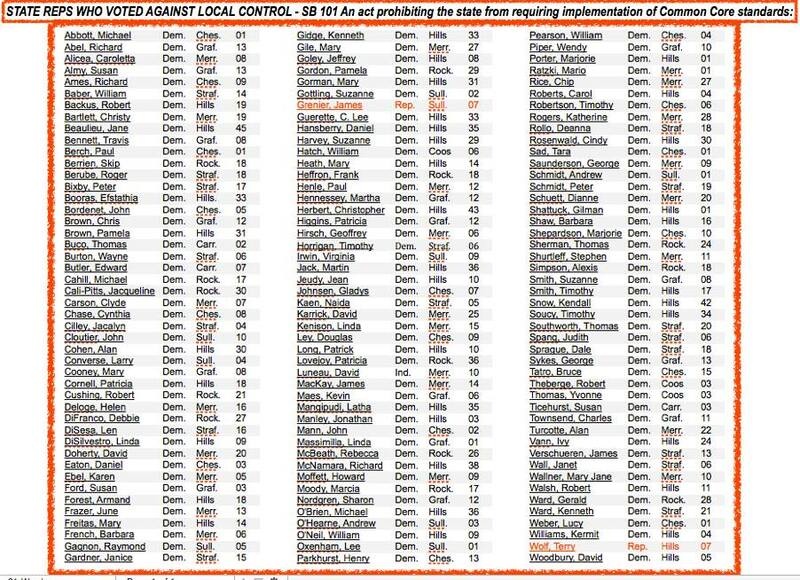 This continues to show parents that Democrats in NH along with a handful of Republicans continue to work against them. Remember to thank these Senators for supporting parental rights in NH. This entry was posted in NH Legislature, Political and tagged democrats, HB603, ParentalRights, Refusals, SenatorStiles on May 16, 2015 by SCC.